Discover extraordinary scenery, and explore the architectural and cultural heritage of towns and cities that are steeped in history and tradition, once beyond the Iron Curtain. You fly to Budapest, where a coach transfers you to your five-star cruise ship, moored in this beautiful city. The friendly crew will welcome you on board and help you settle into your spacious, luxuriously appointed suite. The ship remains here overnight, so watch dusk descend over Hungary’s capital as you enjoy your first dinner on board. One of the most thrilling aspects of a cruise is waking up somewhere new, and there’s a real sense of excitement as you explore lands unknown to many until the Iron Curtain lifted. Hungary itself has so much to offer. Situated at a crossroads in central Europe, it’s a mesmerising blend of European and Ottoman influences, rich in culture and history. Your adventure begins this morning when you arrive in Kalocsa, a city whose 1,000-year-old lore swirls with tales of warlike bishops, saintly kings, rampaging Ottomans and Magyar heroes. Among its fine buildings you’ll discover an impressive Baroque cathedral and the grand Archbishop’s Palace, with its Ceremonial Hall displaying a replica of the Hungarian holy crown. After your guided tour visit the Paprika Museum; the region is one of the biggest producers of the seasoning that’s an essential part of Hungarian cuisine – goulash being a famous example. There are many types and strengths of ‘red gold’, but the best variety is said to come from here, due to its rich colour and robust flavour. Later take a scenic drive into the Puszta, Hungary’s Great Plain, a hauntingly atmospheric prairie whose spirit is burnt into the Magyar soul. Stretching as far as the eye can see, it is home to villages seemingly frozen in time, while Hungarian grey cattle, spiral-horned sheep and buffalo graze on its pastures. The Puszta is also famed for its horses, and visit an equestrian farm to watch a performance by some of the region’s most skilled riders. You’ll have the opportunity to take a horse-drawn carriage ride and experience this unique wilderness from a different perspective. The city of Pécs is one of the many gems waiting to be discovered on this cruise, and it’s all the more engaging because so few have heard of it. It’s a wonderful cultural and artistic mélange reflecting the many peoples who, over time, have held sway in this region. Nestling against the verdant slopes of the Mecsek mountains, its almost Mediterranean climate yields a fertile harvest of fruits and almonds. This afternoon as you tour the rambling streets you’ll discover a 4th-century Christian mausoleum – now a UNESCO World Heritage Site – as well as a former mosque turned into a Catholic church, the ruins of Turkish baths, the magnificent cathedral and the Zsolnay Porcelain Museum, with its impressive collection of vases and figurines. Later return to your ship for a welcome drink with the Captain in the lounge before descending the elegant staircase to the restaurant for a special Welcome Dinner. This morning arrive in historic Belgrade. The only European capital built at the confluence of two rivers, the city has been fought over numerous times, most recently during the Second World War and the Kosovo War, when it faced months of NATO airstrikes. Dramatically sited overlooking both rivers is Kalemegdan Park, which includes in its grounds the city’s iconic fortress, a stronghold built by the Celts, expanded by the Romans and besieged over a hundred times during its history – all detailed in its military museum. Despite its past, Belgrade is now a revitalised and forward-looking city and a delightful and varied place to explore, with delicate Art Nouveau facades tucked away among the stark concrete towers of the Communist era. Enjoy a guided tour, seeing all the main sights such as the cathedral, Republic Square and Prince Michael Street with its wealth of 19th-century buildings, some bearing the scars of recent conflicts among their intricate Habsburg ornamentation. After lunch, you are free to explore this fascinating capital, still one of the least visited in Europe. Maybe you’d like to wander the Old Town’s lattice of winding streets, pausing for a welcome drink in one of the grand coffee houses or visit the bubbling bohemian quarter, which is being transformed into a 21st-century cultural hub by an influx of creative talent. For many, today will be a highlight of the cruise as you begin your passage through the magnificent Iron Gates Gorge. One of the most memorable stretches of the Danube, this is where the river cuts its mighty path between the Carpathian and Balkan mountain ranges, forming part of the boundary between Serbia and Romania. The ‘true’ Iron Gates is a single narrow gorge, but the name covers an entire 83-mile stretch of valleys where towering limestone cliffs plunge into the depths below. During the 1960s and ’70s, two hydroelectric power stations were built here and their dams raised the river level by over 100 feet, submerging a number of historic settlements. We pass through the Great Kazan, meaning ‘cauldron’, where the river narrows to just 500 feet. As the Captain skilfully steers us through, you’ll see the huge sculpture of a Romanian hero – Decebalus – carved into the rock. Created in the 1990s, at over 130 feet high it is the largest rock relief in Europe – it even dwarfs the US presidents at Mount Rushmore. Decebalus was the last king of Dacia, the kingdom stretching from the Carpathians to the Black Sea. A warrior through and through, he fought the Roman Empire in three campaigns before the Emperor Trajan got the better of him. Decebalus fled into the Carpathians, taking his own life rather than being captured. By now you’ll have come to appreciate the luxuries on board your five-star ship – little touches from complimentary dressing gowns and slippers to plush carpets in the corridors and the marble-topped bar. Crossing the border into Bulgaria tonight, you awake in Nikopol, a town dating back to Roman times, and after breakfast drive across the Danubian Plain to Pleven. Surrounded by several thousand acres of parks and forest, the town is famed as the scene of a major siege in the Russo-Turkish War of 1877. The joint Russian and Romanian army took five months to take the town, partly because the defending Turks were the first in European history to use repeating rifles. Pleven was a decisive battle, leading to the collapse of the Ottoman Empire, the restoration of Bulgaria as a state and the independence of Romania. Opened to commemorate the battle’s centenary, the Pleven Panorama tells the story of this engagement through a series of moving photographs and canvasses. Enjoy some free time here, so perhaps visit the St George Chapel Mausoleum, a memorial to the soldiers killed during the siege, or one of the town’s many other museums. Or simply wander the Old Town and enjoy the tranquillity of its pedestrian-only streets. During lunch slip your moorings for an afternoon’s cruising, so why not enjoy the invigorating river breeze up on the Sun Deck? It will soon be time for dinner, so reconvene with your fellow travellers for an aperitif in the bar. Moor overnight in the little town of Oltenita. Today visit Bucharest, with its tree-lined boulevards and elegant belle-époque villas – echoes of the hedonistic 1900s when it earned the nickname ‘Little Paris’ – dotted among the utilitarian architectural legacy of Communist rule. Dominating the capital city of Romania, though, is the astonishing Palace of the Parliament, a colossal concrete extravagance commissioned by the Communist dictator, Nicolae Ceausescu. Started in 1984 and still unfinished, it is the second-largest administrative building in the world after the Pentagon – so big that only 400 of the 1,100 rooms are used. Furnished with all the gaudiness expected from a heartless despot at the head of a bankrupt state, from marble staircases to mosaics and chandeliers, to some it’s a marvel, to others a monument to vanity. On your guided tour see the Palace of the Parliament, which really has to be seen to be believed, and the city’s other main sights, such as the former royal palace – now the national art museum – and the Athenaeum with its impressive Baroque cupola and remarkable acoustics. There are also some superb Orthodox churches and squares, including Revolution Square, named after the 1989 uprising that swept away Ceausescu’s regime. Return to the ship with time to relax before dinner. Perhaps borrow a board game or novel from the library or book yourself in for a manicure or pedicure at the on-board Hair and Nail Salon. Overnight cruise towards the city of Tulcea, clinging to seven hills overlooking the river and regarded as the gateway to the vast Danube Delta on the edge of the Black Sea. Now a UNESCO World Heritage Site, the Danube Delta is the best preserved and second largest river delta in Europe, consisting of 2,200 square miles of rivers, marshes, tree-fringed lakes and reed islands, where nearly 3,500 animal and fish species, and 1,700 types of plant, make their home. A bird-watcher’s paradise, the maze of canals bordered by willows and oaks offers the perfect breeding ground for countless species. Millions of Egyptian white pelicans arrive here every spring to raise their young, while equal numbers of Arctic geese come to escape the harsh Northern European winters. Keep an eye out for cormorants and white-tailed eagles. After lunch, disembark to take an excursion on smaller boats into the heart of this inspirational and tranquil place. Your guide helps to point out some of the fascinating flora and fauna – you could spot a colourful kingfisher or a catfish darting beneath the water’s glassy surface. As dusk begins to fall on this magical landscape, slip your moorings again. Enjoy another delicious dinner, maybe tonight choosing a more intimate dining experience in the Bistro at the stern. Today begin your return passage, but these lands still have so much to reveal. Hold on to your hat up on deck, as this area is well known for its windy weather and windmills were once a common sight. Watch the rocky shoreline drift by, dotted with the occasional ruined fortress. Depart for the ancient city of Constanta, described by the Roman poet Ovid as ‘the end of the world’ and with a history dating back over 2,500 years. Originally known as Tomis, it is said that Jason landed here with the Argonauts after finding the Golden Fleece. Situated on several trade routes, it became a thriving commercial centre during Roman times and still is today. Numerous remains from Greek and Roman times are on display in the city’s archaeological and mosaics museums, the latter housing the largest – an impressive 9,150 square feet – and best-preserved Roman mosaic in the world. Constanta’s landmark is the Art Nouveau casino, with its views of the Black Sea. Now unused, it was built by the Romanian King Carol I, who hoped its construction would transform the city into a bathing resort for the elite during the inter-war years, something that never quite transpired. More recently, it became one end of the shortest navigable route between the North and Black Seas when the Main-Danube Canal opened in 1992. Crossing into Bulgaria, arrive in Rousse, a city known as ‘Little Vienna’ for its wealth of fine 19th-century buildings. A scenic drive brings us to possibly Bulgaria’s most beautiful city – Veliko Tarnovo, the ‘City of the Tsars’ and former capital, located in a rugged landscape entangled by the meanderings of the Yantra River. Its Old Town is clustered on three hills with its houses stacked on steeply sided valleys, while the remains of the once-impregnable fortress complex stands on Tsarevets Hill. Within the walls of this redoubt are the ruins of the Tsar’s Palace and, at the summit, the Patriarch’s Palace, which includes the Patriarchal Cathedral of the Holy Ascension of God. Much of Veliko Tarnovo was destroyed by the Ottomans, but in the 19th century it became an important trading centre again. Tucked away in its picturesque cobbled streets are tiny workshops, where you can watch copper pots being beaten or wooden utensils skilfully carved. It is delightful to wander here, keeping an eye out for interesting traditional snacks to try, admiring the architecture while soaking up the atmosphere. Later head to the village of Arbanassi, set high on a plateau. During Ottoman times, it became a commercial centre for traders and their caravans, crammed with wares bound for places as distant as Italy, Russia and even India. Perhaps visit one of the richly ornamented mansion houses of the period, with their fortress-like stone walls, or the unassuming Church of the Nativity – once inside you’ll be dazzled by the intensely coloured frescoes. End the day with a visit to the Churches of Ivanovo, a fascinating complex of churches, chapels and monasteries hewn into the solid rock during the 12th century and with frescoes dating back to the 14th century, so exquisite and historically significant they are now on the UNESCO World Heritage List. This morning why not take a cup of coffee up on deck and soak up the spectacular open spaces of this landscape, where thick woods of fragrant pine and silver fir cling to the banks, forming a hazy outline on the distant horizon? After lunch moor in Vidin, home to the Baba Vidin, the only entirely preserved medieval fortress in the country. From here, drive into this rugged wilderness and suddenly the horizon is dotted with huge sandstone cliffs, in a spectrum of orange-reds and yellows, eroded into huge, bizarre shapes. These are the Belogradchik Rocks – unique and dramatic, they cover an area of 35 square miles, some reaching as high as 600 feet. Many of these gigantic natural sculptures are named after people or objects they are thought to resemble, while others are associated with colourful legends. Return to the ship for dinner. Later on, maybe enjoy a drink in the lounge with your companions while the resident pianist plays gentle melodies. This afternoon moor in Donji Milanovac and take the short drive to Lepenski Vir, one of the most important archaeological sites in Europe, dating back to 9,500 BC. It consists of a series of Mesolithic villages located on a high terrace overlooking the Danube. The wooden houses were laid out in a fan shape and used one of the first types of concrete as their foundations, while their floors were made of sandstone, often covered with limestone plaster and decorated with red and white pigments. Your guided tour will reveal more about this fascinating place and how these ancient people lived. The numerous fortresses along the Danube are reminders that the area has been fought over for centuries and this morning pass one of the most impressive – the medieval Smederevo Fortress. After a lazy day we moor in Novi Sad, Serbia’s second-largest city, in the shadow of the Fruska Gora mountain, its fertile slopes terraced with vineyards. The climate and the proximity to the Danube make this region ideal for wine production, particularly Riesling, but there are many others produced here including Bermet, a vermouth-like dessert wine with a unique aromatic sweetness. Enjoy a guided tour of this vibrant city which flourished during the 18th and 19th centuries, becoming known as the ‘Athens of Serbia’. See its old Town Hall on the impressive main square, flanked by lovely 19th-century architecture, its ancient castle and synagogue. Towering over it all is the mighty Petrovaradin Fortress with its complex system of underground tunnels. The minute and hour hands of its iconic clock face are reversed, supposedly so that fishermen could still tell the time at a distance. You can learn more about the fortress and its history at its museum. Moor here this evening, so why not enjoy an after-dinner stroll and take in the relaxed ambience of this lovely city? Today cross into Croatia and stop in Vukovar, the country’s largest river port, located at the confluence of the Danube and Vuka Rivers. Vukovar boasted a prosperous manufacturing industry and a picturesque Baroque centre until the tragic events of the civil war unfolded, and the city was almost completely destroyed. Renovation to restore the city to its former glory is very much ongoing. Here enjoy a guided tour, seeing the main sights and learning about the city’s tumultuous past. Drive to the historic city of Osijek, which hugs the banks of the River Drava. Explore the Old Town – behind its thick stone walls lies an intriguing market square, lined by handsome public buildings with pastel-coloured facades. In the Upper City you’ll see the neo-Gothic cathedral, its red-brick spire soaring above the rooftops. Much of Osijek has been restored, but some buildings still bear the scars of the fighting. This evening cross into Hungary again, as the chef presents tonight’s appetising menu. As gentle pastoral landscapes slip by, Budapest’s brooding skyline comes into view once more. Straddling the Danube, this imperial capital is a collage of palatial buildings, grand domes and attractive Baroque churches with soaring spires. From Roman ruins to Ottoman Turkish baths and elegant Art Nouveau facades, the eclectic mix of architectural styles reflects the city’s varied history, with numerous foreign powers ruling here over the centuries. 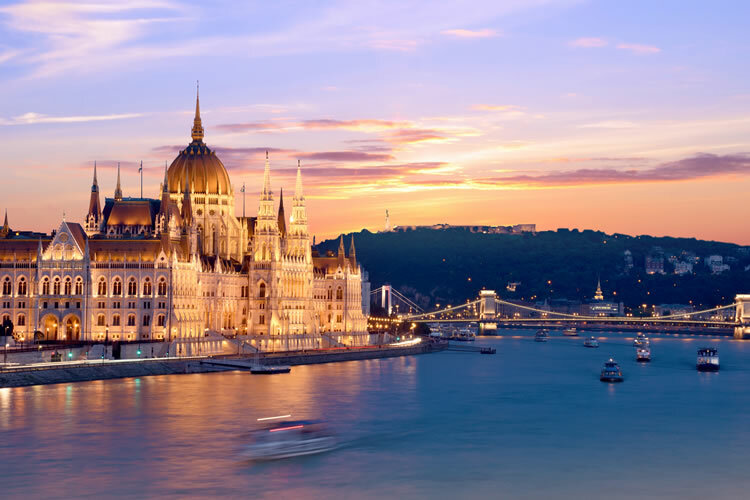 Enjoy a guided tour, seeing all the main sights of this lovely city including the iconic Parliament Building, the National Gallery with its huge collection of Hungarian masterpieces, and the Matthias Church with its intricate rose windows. The rest of the day is at leisure. Perhaps head back to the Castle District to take in the panoramic views or explore one of the city’s many museums and galleries. The Captain’s Dinner is served this evening, with a superb menu reflecting the countries and regions you have visited. As the sun sets on this memorable city, retire to the bar with your fellow travellers to reflect on all you have seen during this exceptional cruise. Today at the appropriate time you return to the airport for your return flight. Guided tours in Budapest, Belgrade, Bucharest, Novi Sad, Kalocsa, Pecs, Osijek, Vukovar and Pleven, a scenic drive into the Puszta with an equestrian Show, a cruise into the Danube Delta: guided visits to Veliko Tarnovo and Arbanassi, the churches of Ivanovo, the rock formations at Belogradchik, and the Mesolithic archaeological site of Lepenski Vir and a visit to the ancient city of Constanta. You can now purchase a drinks package, at a cost of £109 per person.